Create this fun and funky necklace using three types of chain, patinaed flowers and a painted feather pendant. Use the Ver-Day patina Kit to age frosted resin flowers and let dry. 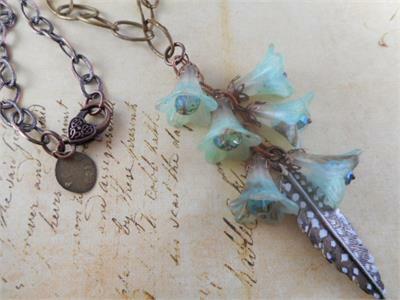 Attach a piece of chain to the middle of a chain necklace and dangle chinese crystal coins inside resin trumpet flowers. The bottom dangle is the feather pendant.